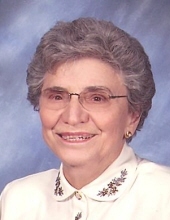 Rita V. Binder, age 92, of Stevens Point, passed away on January 11, 2019. Rita was born on March 10, 1926 to the late John & Theresa (Kinlein) Zimmerman in Rudolph, WI. She grew up in Stevens Point attended grade school at St. Joseph and graduated from P. J. Jacobs High School in 1944. Upon graduating, she entered into the U.S. Cadet Corp and trained in Milwaukee, WI and Phoenix, AZ. She came back to Milwaukee and trained and worked as a computer operator at G.E. Supply until marriage. She married Joseph Binder on August 26, 1950 at Holy Angels Parish in Milwaukee, WI. He preceded her in death on July 29, 1993. Rita and her husband ran a grocery store in Milwaukee until 1960 where they then moved to Stevens Point. She worked at Sentry Insurance for 23 years retiring as a Computer Programmer. Rita enjoyed bowling, golfing, and card playing in her free time. She also relished traveling, especially to Europe, Australia, and China. She spent her free time volunteering at St. Vincent de Paul, St Michaels Hospital, Holly Shoppe, and the Portage County Health Care Center. She was a member of St. Anne’s Altar Society, Catholic Order of Foresters, and Catholic Daughters of America. She is survived by her brother, Gregory (Henrietta) Zimmerman and sister, Kathleen (Conrad) Kraft. She is further survived by many special nieces, nephews, grandnieces, and grandnephews. She was preceded in death by her parents, John & Theresa Zimmerman; husband, Joseph Binder; sisters, Eleanore (William) Cleveland and Bernadette (Kenneth) Hickman; nephew, Robert Cleveland; special godchild, Jeffrey Zimmerman and many extended family members. A Funeral Mass will be held 10:30 a.m., Friday, January 25, 2019 at St. Joseph Catholic Church with Rev. Dennis Stanchik presiding. Visitation will be held on Friday from 9:00 a.m. until the time of service at the church. Burial will take place in Guardian Angel Cemetery at a later date. To send flowers or a remembrance gift to the family of Rita V. Binder, please visit our Tribute Store. "Email Address" would like to share the life celebration of Rita V. Binder. Click on the "link" to go to share a favorite memory or leave a condolence message for the family.